Personal finance gurus will tell you that building up an emergency fund of 3 to 6 months should be a priority, and I agree. You never know what’s going to happen to you, and you need to be able to pay the bills. 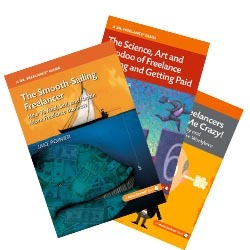 You can say “no” to freelance work without worrying about paying the bills. You can dump bad clients without hesitation, which frees you up to attract more of your favorite freelance projects and work harder for your good clients. It’s a tough economy out there for a lot of freelancers, and saving money can seem like a tall order. But it comes down to choices: Either you build wealth to control your own destiny, or other people and projects will control it for you. What’s the most important business lesson your dad taught you? Do you have a go to hell fund? I want a Go to Hell fund! Actually, I had a stash in the bank thanks to a terrific year in 2012. It came in handy when the hospital stay came unexpectedly. Great way to link that to writing, Jake. Too many times I’ve said “No thanks” to a client (yesterday, in fact) because the price was outpaced by the work required. Easy to leave the low-paying stuff behind when you have a healthy bank account. Exactly, Lori. For me, the nice thing about the GTH fund concept is that it’s a lot more positively oriented than the emergency fund, which you hope never to have to use…but needs to be there for out-of-the-blue situations like yours. That’s a great one, Shay! Thanks for commenting. My dad taught me not to under estimate my worth–“Don’t sell yourself short.” Value the work you do and others will, too. This translates into not undercharging for my services. Your dad was absolutely right, Evelyn. Have a great weekend! Shay, your dad’s advice was brilliant. I wish more people understood that. I think a Go To Hell fund can also help you set boundaries with existing clients. It’s so easy to let them demand more and more of your time until you don’t have the time for other clients. Having some extra scratch in the bank makes me more confident about setting limits because I’m not (as) afraid of getting bounced.